Radioembolization for liver cancer patients is becoming more common—with promising results. Liver cancer is one of the most difficult cancers to treat and is often inoperable. For the last 10 to 15 years, interventional radiologists have been able to offer patients with unresectable primary liver cancers and some patients with metastatic liver cancers an option—radioembolization—that may improve their survival. A treatment but not a cure, radioembolization is a minimally invasive procedure that delivers radiation therapy directly into liver tumors. 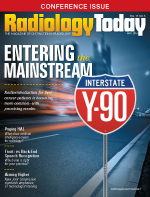 Radioembolization delivers yttrium-90 (Y-90) radiation particles to liver tumors through the hepatic artery. The tiny particles lodge directly in the tumors, resulting in minimal impact to the surrounding healthy liver tissue. The US FDA has approved two agents: glass microspheres in 1999—TheraSphere by MDS Nordion Inc of Canada—for the treatment of hepatocellular carcinoma; and SIR-Spheres resin microspheres in 2002—made by Sirtex Medical Inc of Woburn, Massachusetts—as a first-line therapy for colorectal liver metastatic disease. According to the National Cancer Institute's recently released Annual Report to the Nation on the Status of Cancer, 1975-2012, death rates from all cancers except liver cancer are declining; from 2002 to 2011, mortality rates from liver cancer increased an average of 2.6% a year. Over the same time period, the incidence of liver cancer has risen. According to the American Cancer Society, the number of Americans diagnosed with primary liver cancer and bile duct cancer has more than tripled since 1980. The major risk factors for liver cancer are the hepatitis C virus (the incidence of which peaked from the 1960s through the 1980s, before the virus was discovered and preventive measures were taken), the hepatitis B virus, and cirrhosis of the liver. Risk factors for cirrhosis include heavy consumption of alcohol, obesity, and type 2 diabetes. In fact, some of the increase in liver cancer can be attributed to the obesity epidemic in this country, says Matthew Johnson, MD, a professor of radiology and surgery in the department of radiology and imaging sciences at Indiana University in Indianapolis. "Liver cancer has always been less common in the United States than in the rest of the world," Johnson says. "But America is catching up because of obesity." Treatment options for hepatocellular carcinoma are limited, Johnson says. He says techniques such as microwave ablation and radiofrequency ablation are generally limited to people with a few small tumors. Transplant is often restricted to patients with a single tumor less than 5 cm in diameter, or three or fewer tumors that are each 3 cm or less in diameter. "For the patient to be a surgical candidate, in general, he or she should not have portal hypertension, and the amount of liver that's left after resection should be able to function well enough to keep the patient alive," Johnson says. "Those limitations exclude perhaps 80% of people who present with hepatocellular cancer from having surgery." For many patients, that leaves catheter-based therapy as their best option, Johnson says. Catheter-based therapy can be either chemoembolization or radioembolization. Which is better has been hotly debated. "There are many published papers now demonstrating very consistent survival outcomes between the two groups," says Robert Lewandowski, MD, an associate professor in radiology at Northwestern University's Feinberg School of Medicine in Chicago. "The outcomes, in terms of survival, with radioembolization appear very similar to what we've seen with chemoembolization." That's true even though patients treated with chemoembolization tend to have less disease and are usually healthier to start, he adds. At the 41st annual scientific meeting of the Society of Interventional Radiology (SIR), held in early April in Vancouver, British Columbia, Canada, Riad Salem, MD, a professor of radiology, medicine-hematology/oncology, and surgery-organ transplantation, also at Northwestern, presented results from his PREMIERE study that showed radioembolization to be better than chemoembolization, in terms of time to progression. The clinical trial included 24 patients in the radioembolization arm and 21 in the chemoembolization arm. The patients, all of whom had early disease, were randomized. Salem had wanted to enroll more patients, but found it challenging over the six years that the study was conducted. "We wanted to enroll 124 or so but stopped after 45 because of slow enrollment," Salem says. "Patients don't like the computer deciding what treatment they will get." While his study was limited in sample size, its results were convincing, Salem says. "We learned that radioembolization is much better than chemoembolization in terms of controlling local disease." Patients who received chemoembolization saw progression of their disease in 6½ months, while those who received radioembolization didn't see progression until 26 months. "That we can say to patients, 'You can have one treatment of radioembolization, and I'll see you in two years' is pretty compelling," Salem says. In an earlier prospective study, published in Clinical Gastroenterology and Hepatology in October 2013, Salem and colleagues showed that patients with advanced liver disease reported a better quality of life when treated with radioembolization vs transarterial chemoembolization. That radioembolization not only provides for longer survival but also maintains quality of life is significant, says Edward Kim, MD, the director of interventional oncology and an associate professor of radiology and surgery in the division of vascular and interventional radiology at the Mount Sinai Medical Center in New York. As the Centers for Medicare & Medicaid Services (CMS) requires providers to report more quality measures, quality of life becomes very important with every disease treatment, Kim says. Radioembolization can be applied to multiple stages of liver cancer: early, intermediate, and advanced, Salem says. In some cases, when patients are treated with radioembolization, "their disease is controlled and they're in good shape," he says. In some cases, radioembolization can even be a bridge to transplantation, he adds, because it shrinks the tumors enough that patients could become eligible for transplantation, should a liver become available. "Radioembolization has a better chance of downsizing the tumor to be within transplant criteria so, ultimately, it may lead to curative options," Lewandowski adds. However, he says, if patients have more than 70% of their liver involved with tumors, they are probably not good candidates for this treatment. Radioembolization also has a role in the treatment of secondary (metastatic) liver cancer, which is far more common than primary liver cancer, Johnson says. When cancer spreads to the liver, it's often what causes the demise of the patient, Kim adds, so it would be ideal to have a successful treatment to offer. Nearly 40,000 new cases of liver cancer are diagnosed each year in the United States—in men far more often than women. More than 120,000 new cases of colon and rectal cancers are diagnosed each year in the United States, and about 60% to 70% of people with colorectal cancer eventually develop metastatic liver cancer, according to the American Cancer Society. Patients with colorectal cancer metastases to the liver and neuroendocrine tumors may see longer survival with radioembolization, according to SIR's website. Some patients may also consider radioembolization for metastatic liver cancer that started in the breast and elsewhere, Lewandowski says. "The reality is, at centers like ours, we've treated a few patients with almost every type of cancer and have very consistent results, but it's going to take to a registry to collect and put these data together." Radioembolization is a two-step process involving two outpatient procedures. Patients undergo an angiogram a week or so before they are scheduled for the delivery of the Y-90 microspheres. The angiogram allows practitioners to "map out" the patient's arterial anatomy. This is an important step because "you want to make sure everything [that's] injected goes to your target tissue and not other organs, including the bowel, gallbladder, duodenum, or stomach," Kim says. The angiogram also will show "if there's too much communication between the liver and the lungs to perform the procedure," he says. Some tumors create abnormal direct connections between arteries and veins carrying blood to the heart and lungs. "If you were to do the procedure in someone with this connection, much of the radiation dose might go to the lungs and cause edema and fibrosis." Fortunately, Kim says, this is a rare contraindication. It takes about a week for the agents to be ordered and delivered so patients must come back for a second procedure. "Our radioembolization patients come in the morning and leave by the afternoon," Kim says. The radioactive beads are delivered directly into the tumor through a catheter most commonly placed through the groin area. The beads emit radiation over the course of several weeks. "It's not killing the tumor immediately but over days," Johnson says. The destruction of the tumor usually takes about three months, Kim says. "When you get follow-up imaging, you start to see destruction at three months. You'll see further destruction at six months." Both microbead manufacturers charge about $16,000 for the radioisotopes. Until this year, CMS did not reimburse centers for the full amount of the cost. A committee of SIR members advocated for full reimbursement and was able to convince CMS to change its policy, says Kim, who served on the committee. The cost of one treatment may seem high, Johnson says, but it's important to consider that Y-90 is a single treatment—once and done, in an outpatient setting. Patients who receive chemoembolization are hospitalized at least overnight and need monthly treatments for a while, he says. Transplants, obviously, are far more costly, he adds. Side effects from radioembolization are few. "Most patients are tired for a few days or for a few weeks," Johnson says, and a small percentage experience nausea or vomiting or abdominal pain, "but in the vast majority of patients, the only thing they have is fatigue. That's pretty good when you're treating someone with advanced cancer." Although TheraSphere and SIR-Spheres have been available for more than a decade, until fairly recently, a limited number of centers offered patients radioembolization for treatment of their primary liver cancer or metastatic disease. "Ten years ago, there were very few centers that were performing it," Kim says. "It was very specialized." That's changing rapidly, the interventional radiologists agree. It started at large centers with a more academic bent, Johnson says, "but now it's becoming more mainstream." While the radioisotopes haven't changed, the technology for their delivery has improved. "The tools we use to deliver radioembolization—the microcatheters and wires—are getting better," Kim says. Also, over the last 15 years, interventional radiologists have gained valuable experience making radioembolization a safer and more effective treatment option for patients whose prognoses were otherwise bleak. "While radioembolization has been around for a while, I think the techniques and nuances and patient selection are getting better," Kim says. "Those using it for quite a while feel more comfortable with the technology and, as more users come on board, we're all getting more sophisticated in how we deliver the treatment." When the technique was new to the market, "we were injecting the tumor in a lobar fashion," Kim says, "just from the left side or just from the right side. Now, we're getting more sophisticated and injecting it into selective vessels that are feeding the tumors so that you leave the rest of the liver relatively untouched and spare nontarget tissue." Practitioners also are learning more about dose. "We're learning what minimum dose we should target to get a response from the tumor," Kim says. "We're getting a better sense of that compared to 10 years ago." Radioembolization involves collaboration among multiple specialties including IR, radiation oncology, physicists, and nuclear medicine, as well as radiation safety. "It is a very complex delivery of technology, but we have a better grasp on it as all of us learn more," Kim says. Additionally, practitioners are able to better identify patients who would benefit from radioembolization. With any therapy, patient selection is the key to its success, Kim says. And with experience and better techniques, "patient outcomes are getting better and better." — Beth W. Orenstein of Northampton, Pennsylvania, is a freelance medical writer and frequent contributor to Radiology Today.